Rep. Chris Collins is under federal indictment accusing him of insider trading and lying to the FBI. 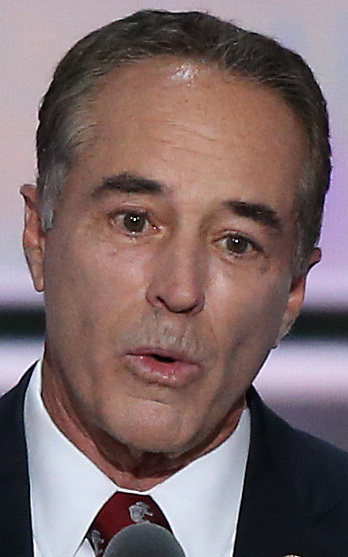 NEW YORK — Embattled New York Rep. Chris Collins will run for re-election in November – even though he is under federal indictment for insider trading and lying to the FBI, upstate Republican officials announced Monday. Collins, the first member of Congress to endorse President Trump in 2016, announced last month he would pull the plug on his re-election bid after the Justice Department indicted him on 11 counts of fraud and false statements stemming from an insider trading scheme involving an Australian pharmaceutical company. But, during a news conference Monday afternoon, Erie County Republican Party Chairman Nick Langworthy said Collins will remain on the ballot. Republicans have tried for weeks to find a replacement for Collins. But since Collins won the primary to represent New York’s 27th district, such efforts have proven all but impossible. Under state law, a primary winner can only reject a nomination if he or she dies, moves out of state or accepts a nomination for another state office. Collins has not been nominated for any other public offices. The development was lauded by Democrats, who say they now have a fighting chance in a traditionally red district. “In the greatest democracy in the world, voters weren’t going to take this kind of sham switching around names on a ballot at the whims of local party bosses,” Nate McMurray, Collins’ Democratic challenger, said in a statement. Collins, 68, has denied any wrongdoing. Federal prosecutors allege that Collins, while serving as chairman of Innate Immunotherapeutics, tipped off his son in June 2017 about undisclosed company information, allowing him to avoid more than $700,000 in losses by selling off his stakes in the pharma firm before the news was made public.